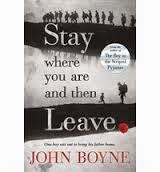 The best thing about this book, 'Stay Where You are and Then Leave, by John Boyne, is the delightful, endearing Alfie Summerfield, the novel's central character. His name has a definite warmth to it, but it is not for that that we come to care for him. Perhaps it is this five year old's love of hard-boiled sweets, or his desire to accompany his father to work everyday on his milk round, or even that he falls asleep on the stairs listening in to his parents discussing the outbreak of the war. For all of these reasons and more, he wraps his tiny fingers around our hearts at the beginning of the book, and never lets them go. The story compares Alfie's world, just as war is declared, with the world four year's later, as the war comes to an end. It is heartbreaking to see how people and places have changed: nothing is untouched. Boyne cleverly illustrates how war can destroy whole communities, even when the battles are fought hundreds of miles away. Alfie is resourceful too, secretly helping his mother to make ends meet, by shining shoes at King's Cross Station. Alfie and his mother have an intimate, caring relationship, yet they still keep secrets from one another - all because of the war. His relationship with Georgie, his dad, is also very close, which is why we come to hate the war almost as much as Alfie. When the war takes Georgie away from us, Alfie and the family at Damley Road, we are all left bereft and constantly fearful that he will not return. Boyne uses this little boy to recreate the war experience of so many families who lived through the Great War. Our anxieties are Alfie's. He cares little about who wins the war, the battles, the generals. the rights and wrongs of it all. What he cares about, is getting his dad back in one piece, and by the end of the book, we feel just the same. The book deals with conscientious objectors, shell-shock victims, internment camps on the Isle of Mann, and ladies who pass out white feathers for cowardice. As such, it deals with many aspects of the war and allows younger readers, and older ones too, to enter into the lives of those who lived one hundred years ago. Boyne has timed the publication of this book to coincide with the one hundred year anniversary of the commencement of WWI, and I think it is as good a time as any to introduce young readers to the experience of those who lived through the war that they said would end all wars. A good read for eleven to thirteen year olds who have a taste for history.